The 9th Circuit Court of Appeals has overturned Barry Bonds conviction for obstruction of justice during a grand jury appearance. "During a grand jury proceeding, defendant gave a rambling, non-responsive answer to a simple question. "Because there is insufficient evidence that (his statement) was material, defendant's conviction for obstruction of justice... is not supported by the record," it said, adding: "Defendant's conviction here must be reversed. It's a sort ruling, just the above paragraphs and one more saying he can't be retried on the count because it would be double jeopardy. One judge dissented. Update: Bonds was sentenced to 2 years probation and 30 days home detention. The sentence was stayed pending appeal. 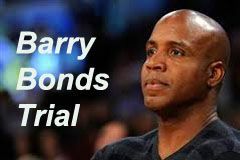 Former baseball giant Barry Bonds faces sentencing today (11 am PT) for his conviction for obstruction of justice, resulting from his evasive answer to a grand jury question in the BALCO steroids use probe. Prosecutors are asking for 15 months. The Presentence Report by the Probation Department recommends probation, location monitoring and community service. Baseball legend Barry Bonds was convicted of one count of obstruction of justice today. The jury was unable to reach a verdict on three counts alleging Bonds made false statements to the grand jury. What an odd verdict. To convict on the obstruction count, the jury had to consider 7 separate statements, and determine which, if any constituted obstruction. They had to be unanimous on the particular statement. Closing arguments were held yesterday in the Barry Bonds perjury trial. If you thought you could get a sense of how they went from media reports, think again. It's like they were in different courtrooms watching different trials. The San Francisco Chronicle reporter leans heavily towards the Government, praising prosecutors and characterizing the defense as "flailing around." ...the prosecutors finished strong, while the defense seemed to flail around, devoting a lot of its time to attacking governmental power. Allen Ruby, the lead Bonds attorney, easily won the best of show award for the trial. Friday, he was a Pavarotti during his closing argument, his deep voice commanding the courtroom as he uttered memorable quotes...By contrast, the leadoff prosecutor, Jeff Nedrow, looked like Alex Smith trying to win a big game for the 49ers. Very smart, very earnest, but never quite able to make the big statement when it counted. The Government began presenting its evidence yesterday in the trial of baseball giant Barry Bonds, who is charged with making false declarations to the grand jury about steroid use and obstruction of justice. Jeff Novitsky, former IRS agent and lead investigator in the steroid cases, was the first witness. He testified Bonds' misstatements to the grand jury hampered the investigation. One of the elements of the false statement charge is that the statement had to be material to the grand jury investigation. Jury selection begins tomorrow in Barry Bond's trial on charges of lying to the grand jury and obstruction of justice stemming from his testimony before a grand jury investigating steroid use. Bonds denied using steroids and denied that his trainer, Greg Anderson, injected him with steroids. Bonds has gotten some good rulings on pre-trial motions. The judge barred the introduction of his drug tests and Anderson's doping calendars. Good news for Barry Bonds today: The UA's and doping calendars won't be allowed at trial. U.S. District Judge Susan Illston said the urine samples that tested positive for steroids are inadmissible because prosecutors cannot prove conclusively that they belong to Bonds. The judge also barred prosecutors from showing jurors so-called doping calendars that Bonds' personal trainer, Greg Anderson, allegedly maintained for the slugger. The judge said prosecutors need direct testimony from Anderson to introduce such evidence. Anderson's attorney said the trainer will refuse to testify at Bonds' trial even though he is likely to be sent to prison on contempt of court charges.